This new publication from Kagero Publishing is in a different format and size to other books that I have seen in the past. The book measures 24cm x 17cm and contains 34 pages. The quality of the paper, photographs and printing is excellent. 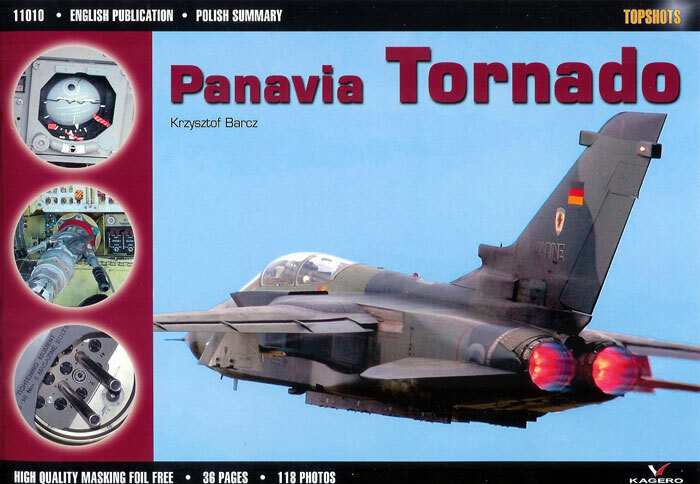 There is very little text on the story and background of the Tornado with the publisher opting for detail photographs with both English and Polish captions. The introduction explains the forming of the multinational company Panavia by BAC (British Aircraft Corporation), MBB (Messerschmitt-Bolkow-Blohm), Fiat Aviazone, and VFW- Fokker. The Dutch company VFW_Fokker left the project shortly after the formation of the company to pursue purchase of US built aircraft. The publication contains 117 photographs all printed in colour, which is very handy when it comes to a reference for detail painting. A few detailed line drawings are included and many of these look like they have come from the original manufacturers maintenance manuals. The book mainly covers the ground attack versions with photographs of the German Air Force and Navy aircraft and the RAF GR1 and GR4 versions. There are some very detailed photographs of the engine nozzles and thrust reverser buckets as well as the full range of weaponry used by both countries. The detail photographed in the wheel wells and cockpit is excellent and will be very useful to any modeler wishing to super detail any of the current kits on the market. The 1/48 scale kits currently on the market suffer from a lack of detail and such close up detail photographic reference is essential. Also included with the book is a bonus is a set of canopy masks in both 1/72, and 1/48. The sheet is crisply cut and looks to be very flexible. In summary, this is a very concise and complete reference for any modeler wanting to build and detail a tornado in any scale.